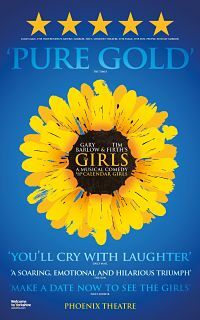 Gary Barlow and Tim Firth's musical comedy, The Girls, will complete its six-month London season at the Phoenix Theatre on Saturday 15 July before returning home to Yorkshire to open at the Leeds Grand Theatre on 15 August 2018 before visiting 42 theatres across the United Kingdom - details to follow. The producers David Pugh & Dafydd Rogers said, "We are so proud and thrilled with this production, and we want to take it to everyone who wants to see it in the country, and at prices they can afford." Gary Barlow and Tim Firth added, "We are delighted with the reception our musical has received in Leeds, Manchester and now London, and are thrilled that the show will be visiting towns and cities up and down the country, so that more people can get a chance to see it and, we hope, will also fall in love with The Girls."